TeamChandah began with a Pakistani community leader from 100 years ago predictingthat descendants would have tea on the moon. AdilJafry never forgot those words as he made his way through the business world,and so the immigrant entrepreneur immediately became entranced when the GoogleLunar X Prize was announced. Not to mention that his children, ages 5 and 9,had been attending space camp in Houston. "Theywere talking about NASA this and NASA that, and there was a lot ofparaphernalia around the house," Jafry said. "It somehow allcatalyzed and came together, but wasn't something I had necessarily thoughtabout as a plan." Whatwas once the domain of NASA space exploration has opened up to privatecompanies, and the Google Lunar X Prize symbolizes that shift to Jafry andother entrepreneurs. He has already named Team Chandah?s future spacecraftShehrezade, the same name of his daughter, taken from the Persian queen in ?OneThousand and One Nights.? YetJafry comes as an outsider to NASA and the space industry, readilyacknowledging himself as ?not the hare? in the race. The Google Lunar X Prize'stechnical challenge requires teams to landa robot on the moon, move at least 1,640 feet (500 meters) and beam highdefinition views back to Earth. "I'vejumped into the deep end of this competition, and I'm still trying to figurethings out," Jafry told SPACE.com, adding that he "joined tolearn" and was enjoying the experience. Thechallenges for the one-man Team Chandah appear daunting, but Jafry made hisfortune with startups. Most recently, he formed TARA Energy in the wake ofenergy giant Enron's collapse by recruiting many close friends who had justlost mid-level jobs. Today TARA is one of the largest independent retailelectricity providers in Texas, with Jafry as chairman and CEO. Jafrynow hopes to gather similar talent among scientists, astrophysicists, aerospaceengineers, and businessmen to get Chandah going. 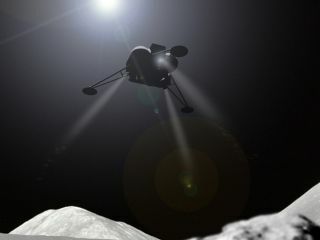 He noted that he would like tosee collaboration with other Google Lunar XPrize teams, having kept in contact with many. "Itnever crossed my mind that Chandah could triumph over others without collaboration,so a win would be a shared win," Jafry said. TeamChandah could certainly lend its business expertise to the critical problem allGoogle Lunar X Prize teams struggle with — how to find people or companies willingto fund a seemingly wild venture. "Idon't think venture capital or private equity will give money for just thecompetition, because you'll be spending multiples of that in terms ofprice," Jafry observed. His initial assessment suggests that most teamswill end up spending several times the $20 million prize money for first place,and many other teams agree — with some exceptions. Teamsmay require a long-termbusiness plan that allows them to thrive regardless of Google Lunar X Prizesuccess. That still stands as a challenge within the fledgling private sectorof space exploration and travel. ?Thedownsides should be covered as much as possible,? Jafry said, adding that a?good risk-return model? should also reward investors many times over ifsuccessful. UltimatelyJafry sees a win for Team Chandah or other teams as a win for all spaceentrepreneurs and a greater vision that surpasses any individual team..
"Tothe extent that winning the competition makes an economic model successful,that'd be phenomenal," Jafry said.